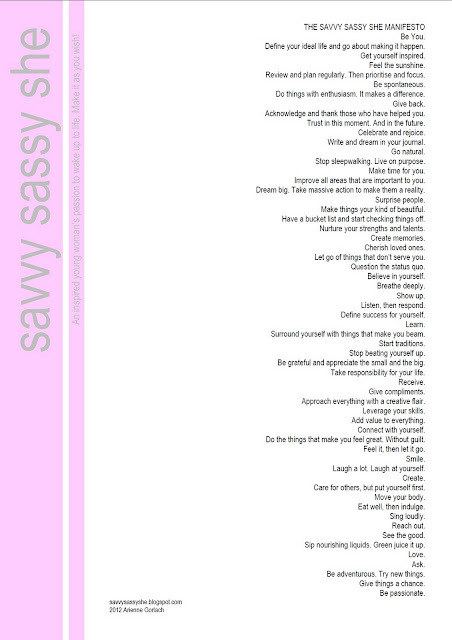 I've always wanted to create a manifesto. I love them. They give me inspiration and lift me when my mood is down. It is a bit of a framework to guide my life. On my wall of inspiration I have the Lululemon Manifesto, The Holstee Manifesto, Goddess Leonie's How to Be A Goddess and the Hip Tranquil Chick Manifesto. 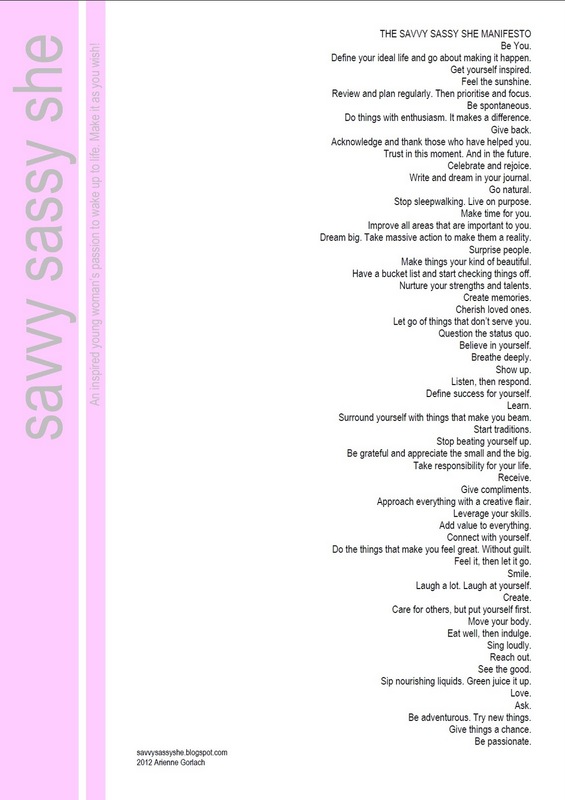 So, introducing The Savvy Sassy She Manifesto! I can't seem to upload it for download via the blog so if you would like a copy please feel free to email me (savvysassyshe@gmail.com) and I'll shoot a PDF version to you. Then you can print it out if you so wish! Define your ideal life and go about making it happen. Review and plan regularly. Then prioritise and focus. Do things with enthusiasm. It makes a difference. Acknowledge and thank those who have helped you. Trust in this moment. And in the future. Write and dream in your journal. Stop sleepwalking. Live on purpose. Improve all areas that are important to you. Dream big. Take massive action to make them a reality. Make things your kind of beautiful. Have a bucket list and start checking things off. Nurture your strengths and talents. Let go of things that don’t serve you. Surround yourself with things that make you beam. Be grateful and appreciate the small and the big. Take responsibility for your life. Approach everything with a creative flair. Do the things that make you feel great. Without guilt. Feel it, then let it go. Laugh a lot. Laugh at yourself. Care for others, but put yourself first. Sip nourishing liquids. Green juice it up. Be adventurous. Try new things.